Some tasks are just not enjoyable to do. Whether you’re an individual worker or a business manager, certain tasks consume time and energy you could be spending elsewhere. Outsourcing particular tasks can help you accomplish more with less time, freeing your schedule to tackling the things you do best. Finding information takes a lot of time. Depending on the topic, you can hire a college student or a knowledgeable professional to research for you. Cleaning is a necessary but tiresome task. Hire a professional service or individual to take some housekeeping chores off your hands. Alternatively, consider purchasing a vacuuming robot. Rather than getting interrupted during a meal or a meeting, consider outsourcing answering calls. Partner with a call-center company or work with a virtual receptionist or virtual assistant (VA). Working on a research paper? Writing company blog posts? Consider hiring someone to proofread and edit your work and help you get your point across clearly. If you can’t stop by the supermarket or don’t have time to browse for the best deal, hire someone to do your shopping for you. This can work both online and offline! Need photos of a special event? Hire a photographer to capture the right moments. You and the other guests can enjoy yourselves without the added pressure of taking pictures. Invoicing for services or products can be tedious. Hire an individual or online service to enter information, send invoices, and track payments. If you’re not an A/V professional, there’s no need to edit your own podcasts or videos! 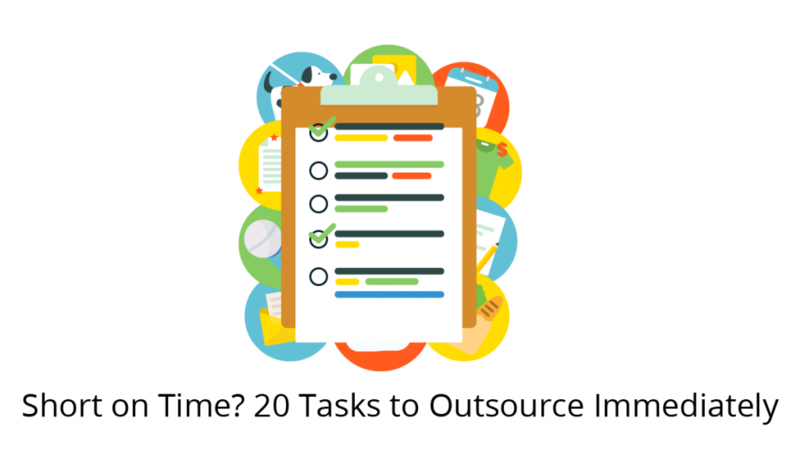 Outsource this task to give yourself or your team more time for what you’re better at. Finding and hiring a bilingual team member to translate documents like official forms and marketing materials is costly. Consider hiring translation specialists instead. A social media presence offers enormous business opportunities, but it can be daunting for people who aren’t familiar with it. Outsourcing social media management can save time and keep your company’s social strategy from being forgotten or pushed aside. As a vital part of your business, your website requires constant attention. Outsourcing website management means you and your team no longer need to worry about fixing broken links, performing backups, or updating content. If your company website includes a blog with comments, or you have an active Facebook or YouTube page, it can benefit your reputation and save time to hire someone to monitor and moderate comments to keep the discussion civil. Finding the right file on your hard drive or DropBox account can be time wasting without proper organization. A VA can help you systematize your documents and establish processes to become more organized. As a business grows, managing the financial side of things can become daunting. Outsource this task to trustworthy professionals who can help keep your records up-to-date and secure to ensure accounting and taxes go more smoothly. Although outsourcing customer service has gotten a bad rap, there are ways to do it correctly. Shop around for the best service, and make sure they get the proper training to meet your standards. If you have a lot of data that needs to be recorded and tracked, consider hiring someone to perform your data entry. Hire someone to do it in person or work with an online VA.
Newsletters can help you connect with customers, or keep employees informed and engaged. Any and all aspects of a newsletter can be outsourced: design, images, content creation, or scheduling. If you have time to give presentations, but no time to create them, that’s another task you can outsource. Hire someone (such as a VA) to organize your slides or write your speech. You may have a podcast, meeting notes, or other audio recordings that you need to transcribe. This job can be time-consuming, so outsourcing to a transcription service can be a smart decision. Whether you’re a solo entrepreneur or a high-level manager, these time-saving tips will help you decide how to outsource the tasks that otherwise fill up your schedule and drag down your energy. Emily is a freelance healthcare and business writer who helps organizations improve their content marketing. Her favorite non-writing activities include cooking and road trips. Find her at emjwriter.com. Thanks for the wonderful share, very useful post information. WordPress Theme built by Shufflehound. Copyright 2017 Temi.com. All rights reserved.